On December 1, 1955 Rosa Parks Changed History. Rosa Parks was an extraordinary and remarkable woman for her times. She had the gusto, wit and persistence to outwardly speak against blatant ignorance. Rosa protested in opposition to a direct order from a bus driver to give up her seat to a white passenger. Her boldness and defiance was an important aspect to the movement of desegregation, inspiring the Montgomery Bus Boycott. 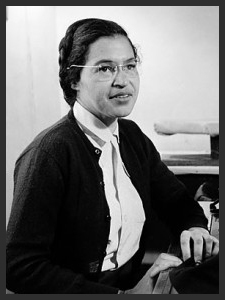 Rosa was instrumental in helping Martin Luther King Jr. launch national awareness with the Civil Rights Movement. Ultimately she was known as the ‘Mother of the Civil Rights Movement.’ She became the icon for African-Americans who suffered such despicable injustices and humiliation of racism. Her legacy still lives on. 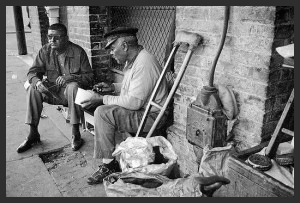 African-American people faced during those times in their daily encounters. It was poignant and captivating because John Howard Griffin was a white man. Through the assistance of a doctor, he artificially darkened his skin. Rather than simply go through the process of interviewing people, he wanted the experience of social injustices to be firsthand. It is difficult to fathom that such hateful prejudices, demeaning actions existed. Today ‘outward’ behaviors have changed, a tremendous shift towards fairness and decency; yet, unfortunately bigotry, intolerance, narrow-mindedness towards our differences still exists. It is intolerable and unthinkable that even after 63 years, some of the same issues still exist today. Rosa Parks was a maverick in her own time paving the way to change. Incredibly so, still in today’s times, African-Americans are treated differently in our society. Like Rosa Parks we should not stand for any injustices. As Martin Luther King, Jr. so eloquently put . . .
Let’s make a difference, celebrate each other, and pave the way to a better world! As a tribute to Rosa Parks, John Howard Griffin and many others who continue to make a difference, imagine there are no differences, ‘Imagine there’s no countries’.